Hello, I'm Amanda, a Handspinner and Dyer who lives in Cornwall, UK. This site gives details of my handspinning, dyeing and other crafts. 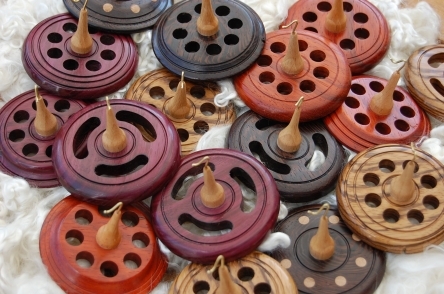 I also teach handspinning and dyeing to individuals or small groups. I can be contacted by email by clicking the link above, and you can download a pdf version of my course brochure from the 'Courses' page or alternatively request a copy by email. I also travel around the country and occasionally to Europe giving talks and workshops, and there is a seperate brochure which gives more details. I have an Etsy shop selling some of my hand-dyed fibres and also the occasional skein of yarn and a spindle or two. If you would like to see what I have for sale at the moment, please click the link at the bottom of the photo panel on the left and that will take you straight to my shop. I hope you enjoy browsing my site (a visit to the site map page will give you more details of what is on each page), if you have any questions please feel free to email me! Gerard v.d.Heijden has a website, for more details of the individual designs and how to buy his spindles direct please click on the photo (right) or link (above). Made in The Netherlands by Gerard and test spun by his wife Ineke. Beautiful woods & beautiful balance equals beautiful spindles!